Making your existing heating system more effective Noisy or unreliable boilers, clunking pipes and cold radiator tops and bottoms are all symptoms of an inefficient heating system. Power flushing will remove the sludge and corrosion deposits which cause these problems and enable it to function effectively, giving you a warmer, quieter house. You may also find that you save money due to the systems' improved efficiency. Power flushing, also referred to as jet flushing and hard flushing, involves pumping water at high velocity through the heating system to force out accumulated deposits. The process is made more effective by the addition of powerful cleansing and mobilisation agents and the addition of corrosion inhibitors after flushing protects the system from future rust damage. 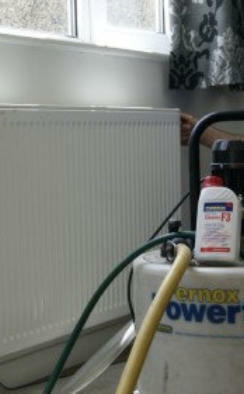 Gilmore Plumbing uses Fernox chemicals. A system power flush by Gilmore Plumbing Coleraine takes less than a day and we aim to cause as little disturbance as possible.